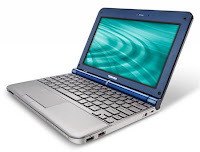 I've been itching for a Netbook for awhile. My desktop is fabulous (especially with the awesome monitor I use), but I really wanted something a bit more PORTABLE for when we're upstairs. Not that running up and down the basement stairs isn't good for me, but I really do like to make laziness an art form. So I asked the Smart Man for a Netbook for Christmas this year, and we've been looking at them periodically for about six months. Last night, he bought me the Toshiba NB205 in Royal Blue, pictured at right. It's so small! It's so light! It's so cute! I decided on the Toshiba because while I have very small hands, I was concerned about my ability to type on a Netbook and the form factor of the keyboard seemed to suit me the best. The fact that the keys are discretely set in the case makes it easier for me to type without error. Right now it's running Windows 7 Starter Edition, but when things slow down for me professionally in December, I may bite the bullet and load up Linux, instead. Just kidding. Linux isn't that scary, especially since my fellow UCFer Shawn writes for the Linux Journal, and my Smart Brother-in-Law has ongoing nerd love for the open source movement. I'm quite sure I could ask either one of them for assistance if I run into trouble. Right, guys? Guys? In any event, I bought a cute little travel case for it so I can take it with me when I travel, as well as a wired mouse. Yes, I know how 20th century that is, but I despise touch pads, and don't want to bother with changing the batteries on a wireless mouse. So early Merry Christmas to me! Thanks, Smart Man! Aren't you a couple of weeks early? I'm running eebuntu on my netbook and quite like it. Steve, I always get my gift early. I'm not quite sure how that started, but "Christmas in November" is pretty much the norm when it comes to what the Smart Man gives me for Christmas. And Shawn, I shall not be inciting the TSA to knee tackle me in any airports. Because that would probably make me cry. Very nice! I like me cheapie and since my other laptop monitor dies, it saved my sanity! I figure I have about 4 years* to decide what I want to do for real about laptop/desktop/windows/linux. *I have a PLAN. Yes, Miss I-Have-Been-Flying-By-the-Seat-of-My-Pants-All-My-Life has an actual PLAN. A GOAL. Yessssssss! "We don't need no stinking plan." Seriously, Janiece: I only use Windows for games. For anything else, it's Linux, and that includes the Dell netbook that I use for websurfing and odd writing. Can I use Windows Live on a Linux OS? How about the Twitter client and Firefox? Why, yes, I am completely ignorant of Linux in a consumer environment. Thanks for asking. You can still check your microsoft email with Linux, via the web -- but the fancy Live tools aren't there. You're just pimpin' your favorite OS, dude. As Shawn said, checking Hotmail isn't a problem. I don't really IM, so I can't say what other Live tools are missing. The Twitter client I've been using on everything except the BlackBerry is Spaz, which is an AdobeAIR app--which answers two questions, maybe: there are lots of Twitter apps in Linux and you can use AdobeAIR if you want to under Linux. Like I said earlier, I only boot into Windows when I want to play a video game on the laptop. I've had no shortage of other apps for writing, browsing the web, reading PDF-format eBooks, or doing almost anything else I've wanted to with maybe one notable exception--I've never been able to get a Canon printer to work, although I so rarely print at home that I haven't even tried to print in Linux with any recent version of 'buntu, so it hasn't been much of an issue for me. Again, I don't really IM, so I can't speak to that part of it. What I will point out FWIW, though, is that if I only use Windows for games, it follows that Linux is my OS for Get-Stuff-Done. Which it is. So are various Linux-tans compared to their Windows counterparts, but that probably isn't your thing. Have I mentioned that my printer is a Canon MP970? That shouldn't be a problem, actually - if I need to print, I use my desktop. I use Firefox and Twhirl and Pidgin on my Netbook, and they all work like a dream. Haven't tried to do any writing, but I downloaded Gimp and used it to modify images. I was also able to download pictures from my camera as well as the Flip. I would assume that Thunderbird is available for Linux, however, I'm pretty much using gmail and yahoo to access all my e-mail (excluding work) at this point. Yay for new Toshiba! And a pretty royal blue to boot! 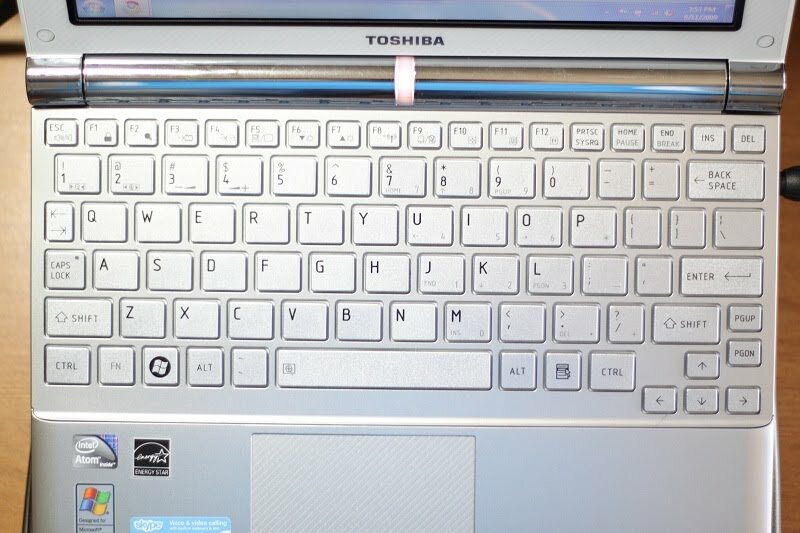 Just got a Toshiba Satellite, which, so far, is a decent little machine, but the thing that bugs me most about it is the keyboard and the stiff buttons on the keypad. Most likely I'll be getting a trackball to use with it, but I'll just have to get used to the keyboard, I guess. Still, for the money I spent, I think I've got a good machine. As long as it lasts for a couple of years, I'll be happy. I still love my "toy". It totally saved my mind when I was recently incarcerated (fine, hospitalized, but it felt like jail). I run XP (whatever edition -- that's TH's dept), Firefox, and a few games and graphics programs. Oh, and Word 2003. Works lovely. Doc, while I don't anticipate being incarcerated anytime soon, I can see why a NB would come in handy in those circumstances. I tend to prefer pidgin for IM even when I am working on Windoze. I much prefer Linux to Microsoft, but sadly any schooling seems to require things like MS Word which you can get close with OpenOffice, but sadly it isn't perfect. All in all though I would like to move to Linux on all things if it weren't for being addicted to games that just haven't made that transition. Shawn, I'll probably take you up on that, with my Smart BIL as my backup. Thanks!